Conserve energy and reduce your refrigeration costs by using this Curton PP-C-080-34108 34" x 108" Polar-Pro swinging door. 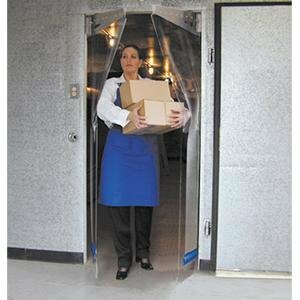 Perfect for walk-in freezers, supermarkets, restaurants, and bakeries, this Polar-Pro swinging door is a great alternative to strip doors. Without any strips to get stuck or in the way, this swinging door allows you to keep your freezer door open for easy access, and blocks any warm air from entering and causing temperature fluctuations. Capable of fitting an opening measuring 34" wide and 108" high, this Curtron swinging door comes with stainless steel universal mounting hardware for either in-jamb or face of wall mounting, allowing you to install it wherever is most convenient. This hardware maintains a tight seal along the top of the door opening and around the hinges, preventing cool air from escaping. The hardware also carries a lifetime warranty against corrosion, so that your Polar-Pro swinging door is always sure to be in perfect working condition. Its set of spring hinge design Even-Plane Stainless Steel swing arms and the included "No-Curl" strip allows the door to swing open and close on an even plane and ensures that the door hangs straight. 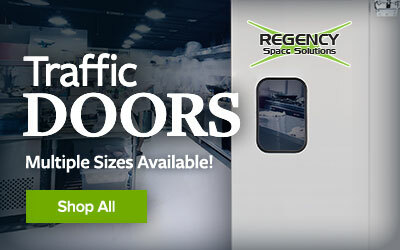 Made of 3/32" thick USDA Low Temperature Clear PVC, this door is capable of remaining flexible in temperatures as low as -20 degrees Fahrenheit and is perfect for use in any temperature sensitive area.